When food rations cut into the kitchens and pantries of the 1940s, the Department of Agriculture responded with a series of WPA posters on creating Victory Gardens to help add to the plates of Americans everywhere. The response was immense. 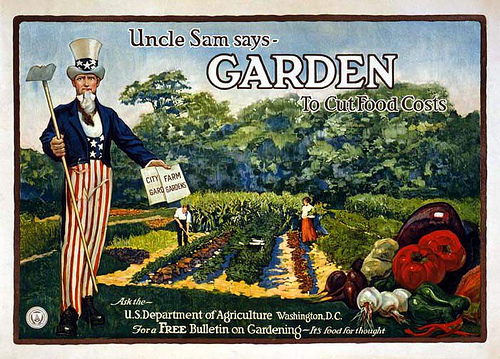 Victory Gardens sprung up all over the United States, and a generation of vegetable farmers were created within cities and towns where they otherwise might not have. The idea of producing your own crops as a matter of patriotism and national pride swelled then, and dwindled through the 60s and 70s. With the economy on the most drastic downturn since the Great Depression, it’s becoming an attractive option to grow food again. Frugal is the new black, they say, and what could be more frugal than growing your own food? We’ve got a few talented amateur gardeners here at We Love DC, and we’ll be doing a set of year-round features on growing your own produce, maintaining a garden even in the smallest of spaces. So, let’s introduce our participants. John’s got a small balcony in North Arlington that will play host to our garden in the sky. Like many urbanites, his pad doesn’t have any loam to call its own, but that doesn’t mean you still can’t produce kitchen herbs, tomatoes, cucumbers, radishes and even green beans some 80 feet into the air. John will be talking a lot about container gardening and preserving your produce for keeping throughout the year. Tom’s has a condo in Fairlington with a small back yard, including a raised bed for vegetable gardening. Like a lot of inner suburbanites, there’s space for growing outside, as well some containers to work with and grow smaller crops. Tom will be talking a lot about the challenges of narrow sunlight windows, soil you can’t control, and growing effective patio gardens. Ben and his wife have a house in Springfield on a quarter acre of land. They’ll be working exclusively in the ground, with a three foot by twenty foot tract of garden space for us to grow everything from potatoes to squash to cucumbers and tomatoes. They’ll also be talking a lot about their flower discoveries, as the previous owner of their house was an avid flower gardener, and this will be their first spring in the new home. Thanks to a generous donation of space out in Leesburg, we’ll also have a great big chunk of open space out by the Oatlands Historic House. We’ll be experimenting here with everything from Corn to large melons and squash, to the typical garden vegetables. We’re very excited about these new features, and we’ll be starting up on Friday with our first feature about growing from seeds, and getting ready to start with the seeds process. Are you starting a Victory Garden this spring? Have you bought seeds and supplies yet? Images here are from the National Archives WPA galleries. Of course, don’t forget the best gardening book ever, The Victory Garden (really, my father swears by it).